FBI Director Christopher Wray reaffirmed in public remarks what his peers in the intelligence community have been saying over the past three days about Russia's interference in the 2016 election and ongoing efforts. "The intelligence community's assessment has not changed, my view has not changed -- which is that Russia attempted to interfere [in the past election] and continues to engage in malign influence operations to this day," he said, during a conversation with NBC's Lester Holt at the Aspen Security Forum Wednesday. He dismissed the idea that the FBI would consider Russian President Vladimir Putin's offer to allow U.S. agents to travel to Russia to interrogate indicted individuals "Not high on our list of investigative techniques," he quipped. On the topic of the special counsel's investigation into Russian meddling in the U.S. election and whether associates of Donald Trump's presidential campaign colluded with Russia, Wray said, "I do not believe special counsel Mueller is on a witch hunt." Asked about the president's criticism of the FBI, Wray had a pointed response: "Would we prefer not to be criticized? Of course. But at end of day, the criticism we care about is from people who know our work." He did say of his relationship with the president, "I have a very professional relationship with the president." Of FBI investigator Peter Strzok, Wray said, "We're talking about one person ... there's a pending personnel matter, and I want to make sure we're doing things by the book ... I'm not going to make decisions based on yelling and screaming. I'm going to make decisions based on process." He indicated that he would continue to work with Congress and its demands for documents for its investigations, but he laid out boundaries for his cooperation. "I'm committed to being responsive to oversight but also unwilling to budge" if it risks compromising sources and methods, he told Holt. 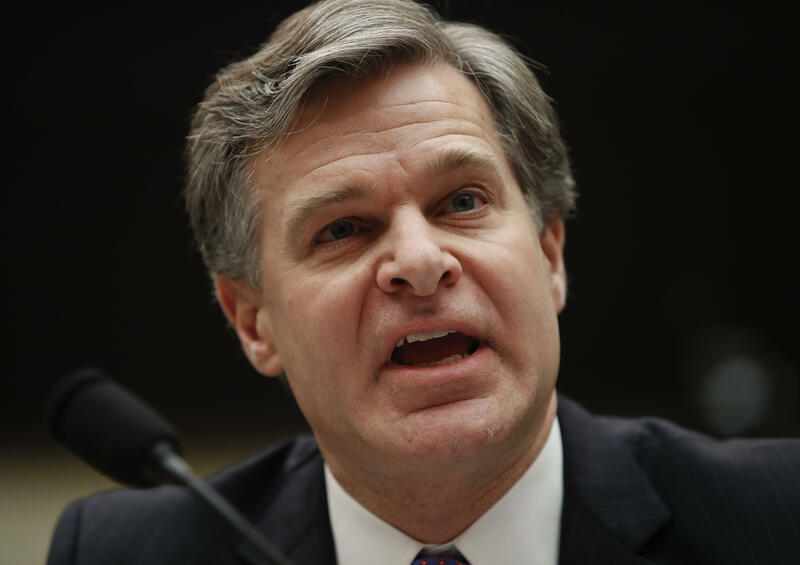 For Wray, China, from a counterintelligence perspective, represents the "broadest, most pervasive, most threatening challenge we face as a country ... the volume of it, the pervasiveness of it, the significant of it is something this country cannot underestimate." It's a packed house with panelists, journalists and members of the public. Just after the conversation began, Director of National Intelligence Dan Coats walked in with his detail and settled in near the front.